Benvenuti al portale della fotonica in Italia (e non solo ....). FOTONICA.IT è una associazione senza scopo di lucro, creata nel 2001 come Comitato Italiano per la Promozione delle Scienze e Tecnologie Ottiche ( COST-01), con lo scopo di promuovere e divulgare in Italia la conoscenza e le applicazioni delle scienze e tecnologie ottiche e fotoniche, sia attraverso la creazione di una biblioteca virtuale che collaborando all'organizzazione di convegni nazionali ed a partecipazione internazionale. A tale scopo esiste una stretta collaborazione sia con la Societa' Italiana di Ottica e Fotonica (SIOF) che con la International Commission for Optics (ICO). FOTONICA.IT is a no-profit association, established in 2001 as Italian Committee for the promotion of Optical Sciences and Technologies ( COST-01), with the aim of promoting and spreading in Italy the knowledge and the applications of optics and photonics, both by means of a virtual library and through the organization of national and international scientific events. A close collaboration exists with the Italian Society of Optics and Photonics (SIOF) and with the International Commission for Optics (ICO). The scientific program includes two plenary lectures, 14 invited talks, almost 70 oral presentations and almost 60 posters. 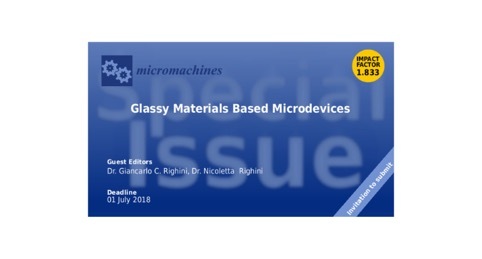 A Special Issue entitled "Glassy Materials Based Microdevices" will be published in the journal Micromachines (ISSN 2072-666X, IF 1.833). The aim of this Special Issue is to provide an overview of the current state-of-the-art in this area and to present perspectives of further development. Contributions related to the technologies, glassy materials, design and fabrication processes, characterization, and, eventually, applications are welcome. The deadline for submission of original or review papers is 1 July 2018.